Some years ago, I published a paper titled: The stratification of cause: when does the desire of the leader become the leadership of desire”. The paper’s aim was to understand an enterprise not so much in terms of its business model(s), as in terms of its being a response to an undecidability, experienced by its client-customers, in relation to which it created value. The ‘desire of the leader’ had to give way to the ‘leadership of desire’ under conditions of environmental turbulence in which a highly connected environment gave rise to tempos of demand that quickly rendered any static business model(s) obsolete. The demands of client-customers had to be responded to one-by-one in how the enterprise created value. This had to be a process of continuous innovation responding to the demands as the demands arose in their contexts-of-use. The confusion of levels of hierarchy with emergent strata hides the fact that descriptions in terms of ‘levels’ are unable to account for the emergence of strata either as a natural phenomenon or as an artifact of the process of observation. The emergence of strata can be defined, however, without invoking the prior concept of levels. It does this through the use of the concepts of spatial and temporal scope, spatial and temporal resolution and state. Spatial scope is defined by a spatial boundary. Spatial is used in the broadest sense of the word to include conceptual and formal, as well as physical spaces, provided the system has a physical manifestation (spatial refers to the set of components, in contrast to temporal, which refers to the dynamics of those components). The spatial scope of a system representation is the set of components within the boundary between the associated system and its environment. If an observer shifts from representing the system to representing a component, such that the component is now the system-of-interest, the scope of observation has narrowed. Conversely, when the scope is increased to include components that were previously part of the environment, the scope has broadened. There is also a temporal dimension to scope, temporal scope defining the set of moments of time over which the system is represented. In Jaques’ terms, therefore, a broader spatial scope of a system-of-interest defines a greater span-of-complexity, while a broader temporal scope defines a longer timespan-of-discretion. Spatial resolution is defined by the spatial distinctions made in describing the representation of a system-of-interest. In comparing two alternative system representations, if a fine (high) and a coarse (low) resolution representation have the same scope, the fine resolution can distinguish a greater number of possibilities. Once the resolution is set, this determines the ‘size’ of the components that comprise the system-of-interest. There is also the temporal resolution of a representation, defining the duration of a moment in time, where longer moments represent coarser (lower) resolutions. The State of a system is the information that distinguishes between alternative system representations at some spatial resolution and moment in time. 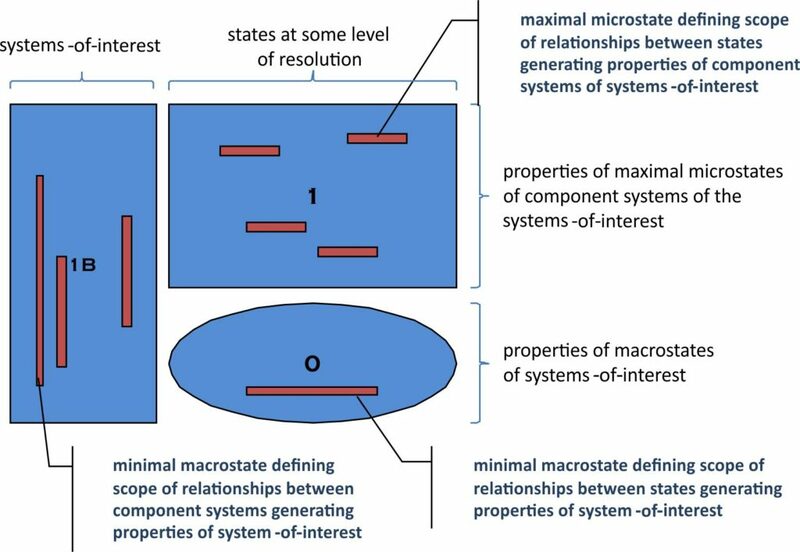 A macrostate M and microstate μ denote states with two different resolutions and scopes, with macro-to-micro relations such that the macrostate has either a coarser resolution or a broader scope, or both. A property of a system-of-interest, then, is defined as emergent if (and only if) it is present in a macrostate and not in a microstate. This leads to distinguishing novel emergence from weak emergence. A property of a system-of-interest is a novel emergent property if (and only if) it is present in a macrostate but not present in any microstate, where the microstates differ from the macrostate only in scope. In contrast, a property is weakly emergent if (and only if) it is present in a macrostate but not present in any microstate, and this macrostate differs from the microstate only in resolution. A weakly emergent property is a limitation of the observer, therefore, and not a property of the system-of-interest. There was novel emergence in the way manufacturing processes and supply chains were organised to enable Bob Martin to produce the conditioning powder – under no circumstances could the powder be the predictable outcome of the constitutent parts of those processes and chains. A system-of-interest is defined by the set of properties that characterise and identify that system. For each property, the minimal macrostate is identified, which associates that property with a particular scope. The system boundary is defined as the set union of the scope of each property. The resolution must be at least as fine as the highest resolution minimal macrostate. This definition removes the effects of weak emergence in distinguishing systems-of-interest and their component systems. 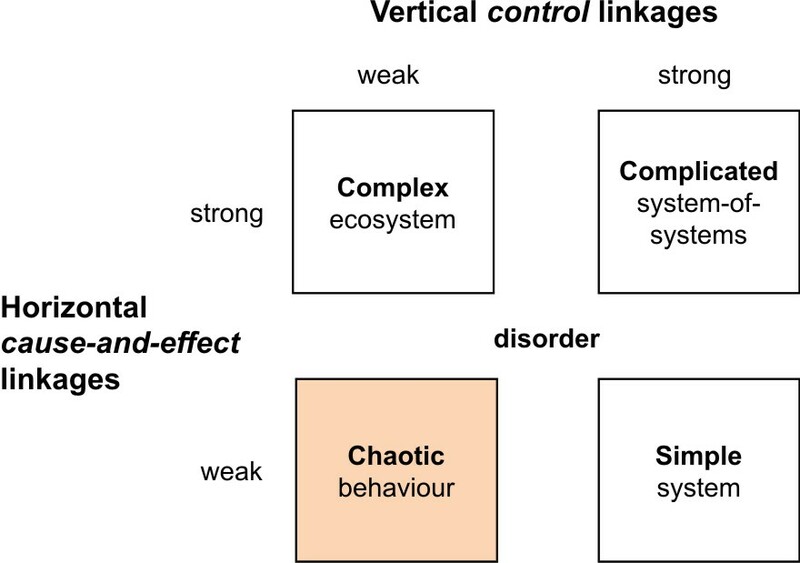 In these terms, therefore, while the behavior of a system-of-interest exercising control relationships over the behavior of its component systems exhibit weak emergence (i.e. its components have an is-a-part-of relationship to the system-of-interest), the behavior of a system-of-interest with a stratified relationship to its component systems exhibits novel emergence (i.e. its components have an is-used-by relationship to the system-of-interest). … The Bob Martin range quickly expanded from the original conditioning powders to remedies and preventative healthcare products for a wide range of canine and feline ills. In 1938 Bob Martin’s opened a showpiece factory in Southport. His son, Robert, was born in 1901 and at the age of 20 followed his father into the family firm. Over the years he gradually took over the business side and was responsible for Bob Martin’s innovative advertising campaigns from the 1930’s onwards. Published in Psychanalytische Perspektieven, 1998. 32(33): p. 137-159. An earlier form of this argument was presented as a paper at the 8th International Conference on Systems Research, Informatics and Cybernetics in Baden-Baden on August 14th-18th 1996, sponsored by the International Institute for Advanced Studies in Systems Research and Cybernetics and the Society for Applied Systems Research. Failure to do this through processes of maladaptation was what gave rise to vortical environments. See Must we fall into the vortex? This is to be seen in The ideologies of Architecture, and the difficulties encountered in the impact of (inappropriate) governance approaches on system-of-system environments, as well as in the north-south bias in leadership qualities and the difficulties of leading organisations without boundaries. This confusion is compounded by the work of Elliot Jaques in his work on hierarchy, which nevertheless makes a distinction between levels and pseudo-levels in arguing the necessary presence of 7 levels in all enterprises. These levels are argued for in the differing nature of timespans of discretion/span or complexity. I begin to disentangle Jaques’ levels from hierarchy in timespan of discretion and the double alignment of know-how. The double alignment is because there needs to be alignment not only to the founding assumptions of the enterprise, but also to its edges where it meets the demands of client-customers. This is an issue facing not only current ways of understanding the organisation of an enterprise in terms of what is happening to boundaries, authority and containment (the boundaries, authority, role and task (BART paradigm), but also to the way we understand authority itself. An originating innovation is what lies at the heart of a ‘network intervention‘, itself a response to a something lacking made present as a social object. Based on extracts from Alex Ryan’s paper “Emergence is coupled to scope, not level”, September 2006. Implicated also are the concepts of the observer’s perspective and interpretation that influence the representation of a system by an observer. Perspective is that through which some information at a particular resolution is hidden e.g. the state of internal organs to the naked eye; and interpretation allows for there to be multiple valid interpretions, not only in the sense of optical illusions, but also in the sense of there being multiple ways in which the representation of a system by an observer is itself structured by the observer-as-a-structuring-system – Miller, J.-A. (2009 ). “Action of the Structure.” The Symptom 10(Spring). We will return to this in a later posting. This example is taken from Bob Martin History. A closely related concept is scale, which is a transformation by multiplication. The connection is that as a property is scaled up (multiplied) within a system, it can be detected at coarser resolutions. The distinction (which is rarely made) is that scale is independent of how the system is represented, whereas resolution is an attribute of the representation (scale is ontological, but resolution is epistemological). In essence, weak emergence assumes that the properties of a macrostate can be simulated on the basis of modeling the behaviors of its component systems if enough could be known about their behaviors and interactions. In effect, a presumption of weak emergence is reductionist. See Mark A. Bedau’s (1997) ‘Weak Emergence’ in J. Tomberlin, ed., Philosophical Perspectives: Mind, Causation, and World, Vol 11, Malden:MA, Blackwell. pp375-399. In evaluating platform architectures within ecosystems (modeling the supplier’s relation to indirect value), novel emergence was identified with structural holes of three kinds (corresponding to the three asymmetries) in the relations between component systems with their maximal microstates. These are described in this posting, in stratifying relations of novel emergence subject to supply-side sovereignty, and in surrendering sovereignty – business platforms and K-type propositions. What this use of novel emergence adds, however, is a fourth asymmetry between the effects ladder and its associated demand situation and a something more that always escapes this formulation of an organisation of demand. This fourth asymmetry might be expressed as “what we demand is never what we desire”. This fourth asymmetry is between the effects ladder and its associated demand situation, which define a ‘pseudo value articulation’, and the embodied subject’s actual experience of value and of value deficit aka desire. Note that in Matrix 0, some of the states are considered ‘inputs’, while others are ‘outputs’. This becomes significant when further layers of stratification are considered. For an earlier treatment of this issue in terms of the three asymmetries, see why is a stratification not a universal hierarchy?. For more on the distinction between simple-complicated-complex-chaotic, see the drivers of organisational scope. This is the first of the three asymmetries.